Glycosylphosphatidyl inositol (GPI) acts as a membrane anchor for many cell surface proteins. GPI is synthesized in the endoplasmic reticulum. In humans, a single pathway consisting of nine reactions; appears to be responsible for the synthesis of the major GPI species involved in membrane protein anchoring. The glycosylphosphatidylinositol anchor: a complex membrane-anchoring structure for proteins. 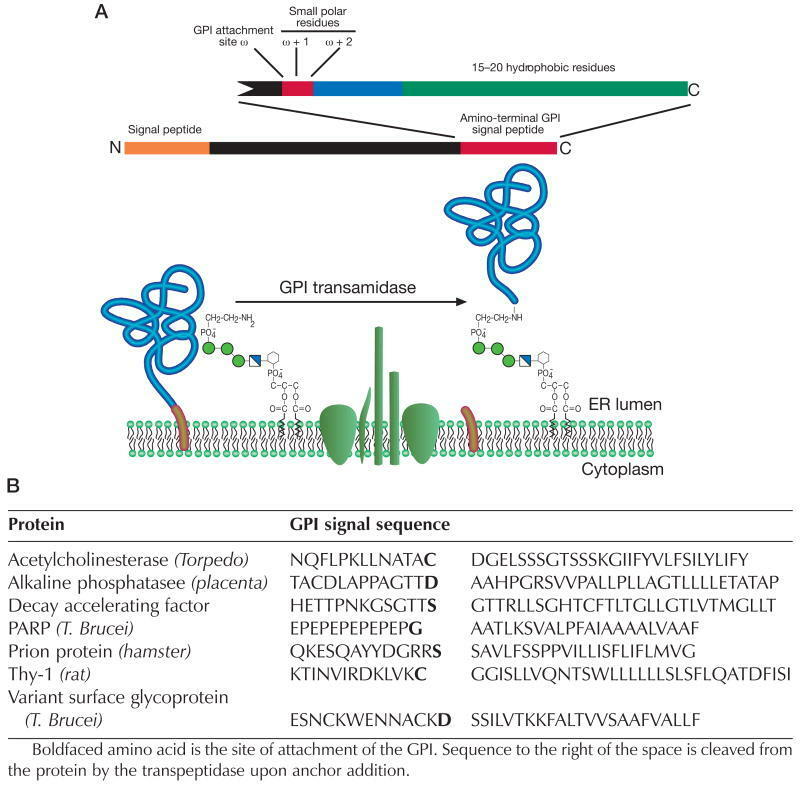 Positioned at the C-terminus of many eukaryotic proteins, the glycosylphosphatidylinositol (GPI) anchor is a posttranslational modification that anchors the modified protein in the outer leaflet of the cell membrane. The GPI anchor is a complex structure comprising a phosphoethanolamine linker, glycan core, and phospholipid tail. GPI-anchored proteins are structurally and functionally diverse and play vital roles in numerous biological processes. While several GPI-anchored proteins have been characterized, the biological functions of the GPI anchor have yet to be elucidated at a molecular level. This review discusses the structural diversity of the GPI anchor and its putative cellular functions, including involvement in lipid raft partitioning, signal transduction, targeting to the apical membrane, and prion disease pathogenesis. We specifically highlight studies in which chemically synthesized GPI anchors and analogues have been employed to study the roles of this unique posttranslational modification. The significance of the GPI anchor structure has yet to be deduced . The GPI anchor could have a genuine functional role in some or all anchored proteins, or it could merely be a vestigial relic. Given that there are many ways in which a protein can be attached to the cell membrane, the GPI anchor is a fairly complicated structure when compared to a simple lipid or transmembrane domain. It is possible that the GPI anchor serves other biological functions besides a membrane anchor. Braz J Med Biol Res. 1994 Feb;27(2):297-301. The tails of two proteins: the scrapie prion protein and the ciliary neurotrophic factor receptor. Stahl N, Boulton TG, Ip N, Davis S, Yancopoulos GD. Regeneron Pharmaceuticals, Inc., Tarrytown, NY 10591. Yoon, H.J., Park, S.W., Lee, H.B., Im, S.Y., Hooper, N.M. & Park, H.S. (2007) Arch. Pharm. Res. 30, 608-615. Release of renal dipeptidase from glycosylphosphatidylinositol anchor by insulin-triggered phospholipase C/intracellular Ca2+.